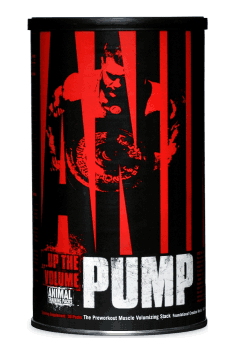 Animal Pump by Universal Nutrition is built on the proven foundation of creatine. It's a no bull, high octane performance supplement designed to help you blast through plateaus and preconceived limitations. There's no feeling like it anywhere... The "pump". The pump is essential in our sport, for it signals the start of new muscle growth. With each pump-inducing rep, nutrient-rich blood floods the working muscle cells, engorging them. This process of "cell volumization" kick starts the muscle building process. Utilizing a unique, advanced matrix of the most cutting-edge forms of creatine, we created Animal Pump for the serious lifter, for traditional creatine non-responders and for those who hate the dreaded creatine "bloat". potent cell volumizers, all wrapped up in a special nutrient transport complex. From top to bottom, Animal Pump is complete and comprehensive - you get everything you need, precisely dosed in a single convenient "pack". So gone are the days of taking 3 or 4 different products together. You don't have to figure out what to mix with what, or spend an arm and a leg on buying several supplements. Just a pack of Pump a day and you're good to go. How can it be any easier to make gains? Animal Pump. Simple. Complete. Effective.